Graham Norton’s masterful debut is an intelligently crafted story of love, secrets and loss. Darkly comic, touching and at times profoundly sad. Graham Norton employs his acerbic wit to breathe life into a host of loveable characters, and explore – with searing honesty – the complexities and contradictions that make us human. Well well well. What a pleasant surprise. 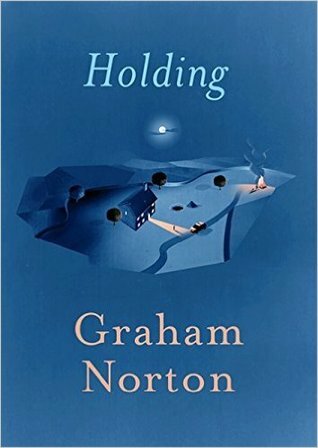 Holding is a wonderfully written debut novel by Graham Norton, yes that Graham Norton, and his trademark sense of humour and wit was found throughout the novel. Holding is set in Duneen in Ireland and focuses on three main characters – Sergeant PJ Collins, Evelyn Ross and Brid Riordan – and the way the mystery affects them as people. The mystery itself – a buried skeleton found at a building site – was surprisingly on the back burner when you consider this was a mystery novel, however, it was well written and kept me interested in the story. For me what made the story was the characters. PJ Collins is a Garda and is basically an overweight, middle aged, lonely shoddy copper. Evelyn Ross is a middle aged woman who fell in love with the wrong man. Brid Riordan is a middle aged woman who also fell in love with the wrong man – the same man – and is stuck in a loveless marriage drinking her sorrows away. The book was more about how the finding of those bones affect PJ, Evelyn, Brid and even Mrs Meany and it was written in such a way that you felt for the characters – I personally felt more for Mrs Meany than I did the other characters but the next one would be Brid. The dynamic between the three main characters was brilliant and the consistency towards the end was good. I think the only thing that put me off was the lack of distinguishing factors between point of view for example, one paragraph would be PJ and the next would be Brid and there would be no line break but other than that it was a very good book!